Switchable nanomaterials based on PbS nanoparticles have scientifically interesting properties and industrially relevant applications in photovoltaics, light-emitting devices and thermoelectric structures.1 In this line the purpose of my MSc research is to prepare new, adaptive PbS nanomaterials by introducing mesogenic ligands to the surface of QDs. The beginning of my work was to design new mesogenic molecules (ligands) that would exhibit contradictory properties – high tendency to form organized, anisotropic structures (to dive the self-assembly) but at the same time low isotropization temperature (to enable switchability).2 The compromise structures are shown in Figure 1. These molecules can self-assemble into anisotropic structures due to rod-like aromatic core and terminal oleyl chain. At the same time low melting point is assured by restricting the number of aromatic rings to two and introducing long alkyl chain. Finally, the obtained molecules are attached to the surface of ca. 4 nm diameter PbS nanoparticles to achieve switchable nanomaterials. Throughout the work several organic and physicochemical techniques were used such as automatic liquid phase chromatography, NMR spectroscopy, small-angle XRD and polarizing optical microscopy. This allows to examine both structure and dynamic properties of the PbS nanomaterials. In future these structures will be examined in respect of their physicochemical properties and evaluated as candidates for devices (LEDs, photovoltaic cells) fabrication. Fig. 1. 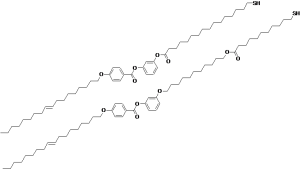 Chemical structures of the goal compounds. Kagan R.C., Lifshitz E., Sargent E. H., Talapin D.V., Science, 2016, 353, 5523–5523. Lewandowski W., Łojewska T., Szustakiewicz P., Mieczkowski J., Pociecha D., Nanoscale, 2016, 8, 2656–2663.